Accident Referral Network understands through experience that establishing your clinic’s presence in the perfect and precise way can be a nerve-wracking experience. Everyone is a web-designer these days. Keep in mind I didn’t say everyone is a good web-designer these days. The fact of the matter is there is more than just the aesthetic design component to making a great Chiropractic website that works for your chiropractic clinic. Accident Referral Network helps chiropractors put their clinic on the personal injury map in their community through innovative design work and vital search engine optimization which will help establish your clinic’s presence as a personal injury provider in your community. Whether your intention is to establish a more well-rounded personal injury presence or to simply to establish the most basic web presence our targeted will help you achieve your goal. Your website should not only be a reference point for your business but also a marketing vehicle to drive patients through the doors of your clinic. If your website is not accomplishing both of these key tasks then we have some work to do. Accident Referral Network employs a team of designers and SEO experts who will help to create the perfect visual representation of your clinic and propel it to the top of the SEO ladder. All of our websites come with integrated SEO. You choose representative and target keywords for your website and our SEO experts will do the rest. Please bookmark this page. We will be adding a FAQ page and recent gallery of our creative work. An optimized personal injury landing page for your clinic can go a long way in creating valuable MVA patient opportunities in for your chiropractic clinic. 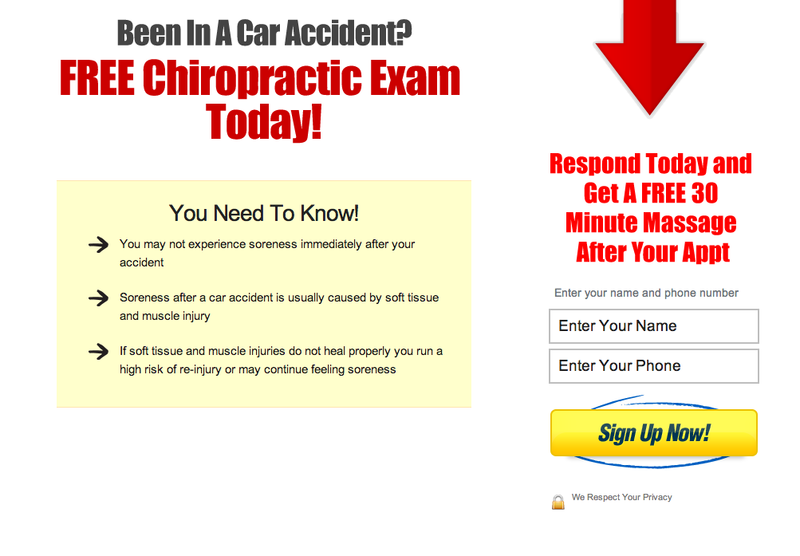 Accident Referral Network helps chiropractic clinics generate more personal injury patients from recent motor vehicle accidents by creating landing pages that can be optimized to create better visibility within your local community and which can also be used in conjunction with satellite marketing campaigns your clinic may employ. Our Personal Injury Chiropractic Websites come in a variety of styles and flavors and are engineered to be a direct response marketing channel that actually works for your clinic by generating qualified personal injury patients from within your local community. To learn how we can help you, start by giving us a call today at (888) 888-0864.